Pamela Anderson (no, not THAT Pamela Anderson) is a self-proclaimed expert in sign law, as well as the owner of a company called Vanguard Outdoor, whose sole business appears to be getting multi-story supergraphic ads installed on several Los Angeles buildings. 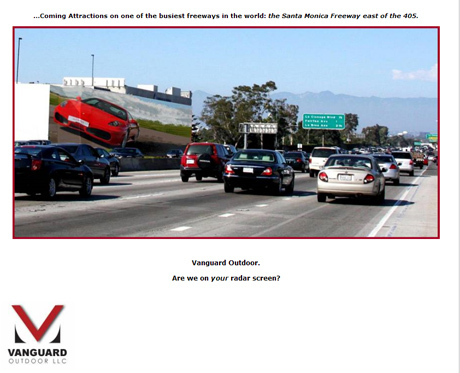 The site above, on the 10 freeway at Robertson Blvd., is one of four her company is actively promoting as sites for the installation of supergraphic ads. See Vanguard Outdoor Powerpoint. The freeway site is the back side of an office building at 3000 S. Robertson Blvd. A non-freeway facing side of that building has been the recent site of at least two supergraphic ads, for the movie “Watchmen” and the Sims 3 computer game. Anderson’s company has also installed supergraphic signs on buildings in Westwood and Hollywood. The Westwood building, at 10924 LeConte, which sports a huge liquor ad across the street from the UCLA campus, also happens to be one of 21 sites where World Wide Rush won a injunction from a federal court judge last year, stopping the city from enforcing its ban on off-site and supergraphic signs. In other words, Anderson has put up a sign at a location staked out by Barry Rush, the man she is suing, alleging breach of contract over a prior business deal. Anderson was also heavily involved in a lawsuit brought against the city by a company called Paramount Contractors, which owns buildings at 6464 and 6565 Sunset Blvd. in Hollywood. A 100-page declaration by Anderson was filed as part of that lawsuit, including her assertion that she was an expert in L.A. sign codes. 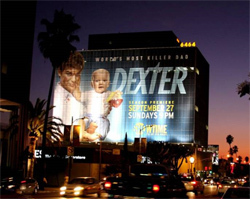 That lawsuit, filed in 2006, challenged the city’s authority to prohibit supergraphic signs at those two Hollywood sites. In 2008, the same federal court judge who shot down the city in the World Wide Rush case decided that the challenge had no merit, and ruled in favor of the city on all counts. However, later in the year the company filed a new lawsuit, and the city agreed to a stay of court proceedings until the outcome of an appeal of the World Wide Rush case now pending in the 9th Circuit Court of Appeals. What does this all mean? For one thing, the astounding amount of potential revenue from these huge, multi-story signs mean that sign companies are going to do everything they can to put them up. Does that mean flouting the law? You decide.